Providing you the best range of Walkway jaali such as Heavy Duty Soldier and Platform with Hook with effective & timely delivery. Our firm is highly specialized in manufacturing and supplying a wide variety of Heavy Duty Soldier. These soldiers used for scaffolding, are manufactured by using best quality material and advance technology in compliance with latest industrial norms. 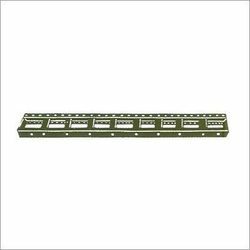 Our offered soldiers are widely reckoned in the market for compact design, corrosion resistant and long functional life aspects. Keeping in mind distinct needs of customers, we provide these soldiers in various sizes. We have complete allegiance in manufacturing, exporting and supplying of Platform with Hook. These platforms are manufactured by using a premium quality raw material for their fabrication, thus making them highly resilient and structurally stable. Widely used for scaffolding needs, these platforms are anti corrosion and come with durable hooks. Available with us in different specifications, we provide these at reasonable price tags to our customers. Looking for Walkway Jaali ?